"Insects can do many things that people can't, " Isao Shimoyama,the head of the bio-robot research team at Tokyo University says. "The potential applications of this work for mankind could be immense." Within a few years, electronically controlled insects carrying mini-cameras or other sensory devices could be used for a variety of sensitive missions - like crawling through earthquake rubble to search for victims, or slipping under doors on espionage surveillance. "We had an incident last week where we sent a roach into an duct to test for an air leak, when we asked the roach to turn right, it responded by asking for our email addresses and offered to send us viagra in return." said Assistant Professor Isao Shimoyama, head of the bio-robot research team. Far-fetched as that might seem, the Japanese government has deemed the research credible enough to award $5 million to Shimoyama's micro-robotics team and biologists at Tsukuba University, a leading science center in central Japan. 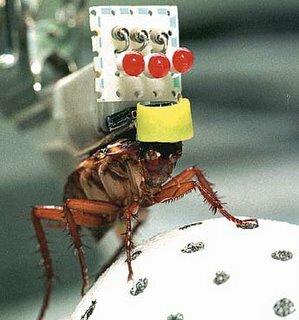 ...they select roaches to equip with high-tech "backpacks" - tiny microprocessor and electrode sets. Wings and antennae are removed. Where the antennae used to be researchers fit pulse-emitting electrodes. With a remote, researchers send signals to the backpacks, which stimulate the electrodes. The pulsing electrodes make the roach turn left, turn right, scamper forward or spring backward. "The technology isn't so difficult," he said. "The difficulty is to really understand what is happening in the nervous system." Perhaps trying to motivate the roaches instead of controlling them would help. corrosion roach robot Corrosioneering Newletter InterCorr International: "Tsukuba University"
I'd say "Cyborg Slave Cockroaches". Also zombies don't have to eat brains. Zombies are undead that walk the earth. I guess that sorta works here since having no control over your body sounds like a base definition of what death is. How Much Can I Get For My Roaches? Per Roach or by the Pound? I am aware of your vile torture and abuse of cockroaches. After the day of Ragnorok, when Gods, men and giants have slain each other in their brainless fury, then will the cockroaches rise up, consume all who remain and inherit the whole world. In that day, I say, you will all receive that which is your due. most of the article is true, i made up this line and posted the rewriten article at my website..
it's all over, israel, germany, usa, canada.. Yes, humanity is moving forward with great strides. I would like to have seen something unusual and mind-boggling.